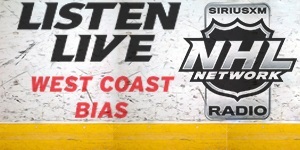 Look for GM Rob Blake and staff to start whittling down the roster real soon, as they push through the process of getting a group of about 60 down to no more than 23 by Opening Night (technically, the team has to submit their list to the NHL a few days prior to Opening Night, but still…). Let’s chip off a few of the easier notes regarding their efforts to trim down, and then look at several of the more difficult decisions. First, as we previously reported, there is no guarantee the Kings will actually go with a 23-man roster. That’s the league maximum. And for salary cap reasons (read: savings), they may actually go with a 22-man roster, from what we gathered in talking with team officials during the Las Vegas Rookie Tournament last week. This will actually make things more difficult for some of the bubble players – more on that in a minute, though. Cutting the first batch of players is typically pretty straight forward – they are junior level players who are too young to play in the AHL and thus, unless they’re making the big club, need to be returned to their junior teams. This list will include guys like Akil Thomas, Aidan Dudas, Matt Villalta, and Markus Phillips. 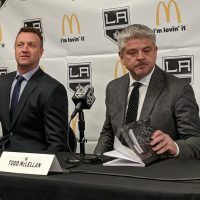 There will also be a whole series of players released from the Kings portion of camp and sent to separate sessions specifically for the Ontario Reign. This list will most likely include guys like Spencer Watson, Boko Imama, Sean Walker, Matt Roy, Chaz Reddekopp, and Cal Peterson. Additionally, while players like Mike Eyssimont and Austin Wagner might get to stay up in main camp a little longer, they are eventually targeted for the AHL this season. 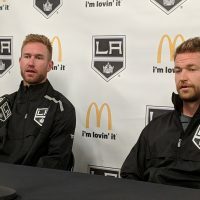 Told nothing is definite at this point .. however, sounding less and less like camp invitees Michael Ivan (D) and Nathan Dunkley (FWD) will be offered contracts by the Kings. Now, let’s pick away at that in reverse order. On the defensive side, we’ve been told the Kings will not carry an eighth defenseman. There are seven spots available and that’s it. In part, this is a function of the 22-man vs. 23-man discussion above. If you’re only carrying 22, that leaves you room for two extra players – one forward and one defenseman. Management has been very impressed with Austin Strand (21-year old, right shot, signed as a free agent last November). However, he will most likely be playing in Ontario this year. Ditto for high-end prospect Kale Clague (2nd round pick in 2016, 20-year old, left shot). They also have Kurtis MacDermid, who will require waivers to go back to Ontario. He made his NHL debut last year, playing 34 games with the Kings. 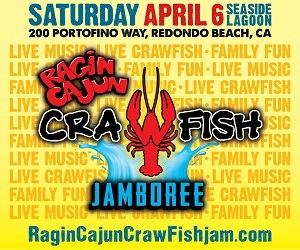 However, given the battle for the seventh spot is already pretty tight. We just don’t see him making the cut, despite how much Stevens and Blake seem to like his toughness. Forbort is currently out injured. If he’s healthy, that only leaves two spots up for grabs; essentially, the sixth and seventh defensemen. There are primarily three guys competing for those spots – Daniel Brickley, Oscar Fantenberg, and Paul LaDue. It’s still early in camp, yet if this were a horse race, Brickley and LaDue have the early lead. We even asked Stevens about the thought of starting the season with Brickley alongside Drew Doughty should Forbort’s back injury linger for a bit and he was open to it. Assuming the latter is healthy, though, one guy is going to get squeezed out. We’ve been given every indication LaDue is expected to make the team. This was also the story last year, and he fell short (largely due, at least in the eyes of management, to not putting in the work last summer to properly prepare). The message seems to have been delivered and LaDue appears to be itching to go. One consideration in all of this will be the waiver status of each. Both LaDue and Fantenberg would need to be put on waivers before opening the season in Ontario. Brickley, on the other hand, does not. While it would be easy to just keep LaDue and Fantenberg up in October – and let Brickley spend a little bit of time with the Reign to adjust to life as pro hockey player – they don’t appear to just want the safe play this time around. We’ve spoken with a few in management regarding this scenario and the consensus is Fantenberg would most likely be the one on waivers and they acknowledge he would likely be snagged by another team (and why not, he’s on a one-year deal at the league minimum of $650K). LaDue’s two-year deal may make him a little easier to sneak through waivers. There’s a lot to consider and much of it likely depends on Forbort’s health in the short-term. However, the inevitable decision between Brickley, Fantenberg, and LaDue will have to come at some point. – Gabe Vilardi, out with a bad back and listed as week-to-week, has really thrown a monkey wrench into things. He was originally penciled in at RW 3, which would have created a fourth line of Kyle Clifford-Nate Thompson-Trevor Lewis with Mike Amadio scratched some nights and cycling in on the other nights. This would have really only left one question – What happens to Jonny Brodzinski, will he make the team as a 14th forward? Now, with Vilardi out, Lewis seems to be one of the guys who might benefit the most, as he’s being looked at for the RW3 spot alongside the Iafallo-Kempe duo. – Before somebody connects the dots incorrectly, Lewis is not a bubble player. He is making the roster. His name wasn’t on the lineup above because he could fill three different spots – RW3, 4C, RW4. Where he lands will somewhat be determined by the other bottom-6 players. – Brodzinski was asked to drop some weight over the summer and he did. He’s in the best shape he’s ever been in and even Stevens praised him on the opening day of camp. 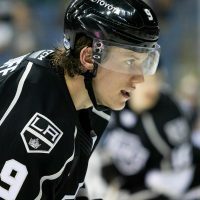 As we’ve stated in the past, he’s one of the best pure goal scorers in the Kings organization. That’s one of the reasons why he was originally slotted in as a top-6 player. Now squeezed into a (most-likely) third line role, even that option was looking slim with Vilardi originally scooping up that spot. Again, now with Vilardi out, the RW3 spot is up for grabs and Brodzinski has a sliver of hope again. A notorious slow starter, there is a tremendous amount of pressure on him to produce this preseason. He needs to make himself visible or risk being the new Michael Mersch. – Free agent Sheldon Rempal isn’t going let the above fight play itself out without at least trying to insert his way into the conversation. Read here for more on the talented winger. He brings speed and the ability to score goals. Rempal also hasn’t been shy about why he signed with the Kings after just two seasons of college hockey. He was a free agent and could have picked any of the 31 NHL teams interested in him (and there were plenty). He chose LA with the sole intention of making the NHL team coming out of camp. Thus, he’ll get some looks at RW3 to see what he brings. – Emerson Etem is in camp on a PTO. If you don’t know the back story on how the 2010 first round pick has ended up in this spot, click here. It’s an interesting story. As for the action on the ice, we just don’t see him making the Kings roster, primarily because Blake has enough tough decisions to make as it is regarding the players he’s already signed to contracts. The organization is a fan of Etem, having known him well since he was a youth player in So Cal. 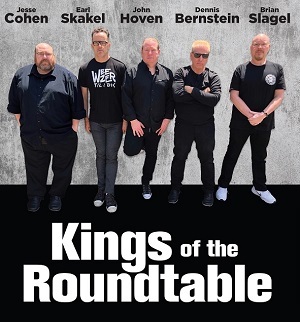 We wouldn’t be surprised to see him get a contract with one of the other AEG-owned teams, like the AHL’s Ontario Reign or Eisbaren Berlin of Germany. 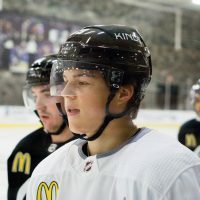 – And yes, we couldn’t write this article without mentioning Jaret Anderson-Dolan (or as one Kings executive told us, the player who has shown the most growth from May to September). He obviously is capturing a lot of attention in camp. Everybody has great things to say about him. At the end of the day, he’s probably a year away. It wouldn’t be that surprising for him to be among the last cuts in camp. He’ll get a look, but it should be back to the WHL for one more season. He just turned 19 years old last week. Another seasons of junior, along with a stint playing for Team Canada at the upcoming World Junior Championship, should only aid in his development. One more year. Be patient. – If you’re looking for a roster long-shot, go with Matt Luff. He surprised a lot of people by showing up in our Top 10 LA Kings Prospects list last season. Management loves him though — especially his shot — and he’s been asked to play a little tougher. Keep an eye on that during preseason. If his chance doesn’t come on Opening Night, look for him to possibly get a sniff of the NHL later this season. This would put Rempal in Ontario to start the year. Could they sneak Anderson-Dolan into a few games to start the season (and carry 14 forwards or even send Amadio to the AHL as a placeholder)? Sure, it’s an option. Probably not probable at the moment. When all is said and done, the larger point here isn’t about how the bottom two lines are constructed, but more about which forwards do and don’t make the Opening Night roster. Throughout the month of October, and perhaps even into November, look for Stevens to routinely rotate guys in that grouping — namely Brodzinski, Thompson, and Amadio — between playing on the third and fourth lines some nights then sitting out other games.